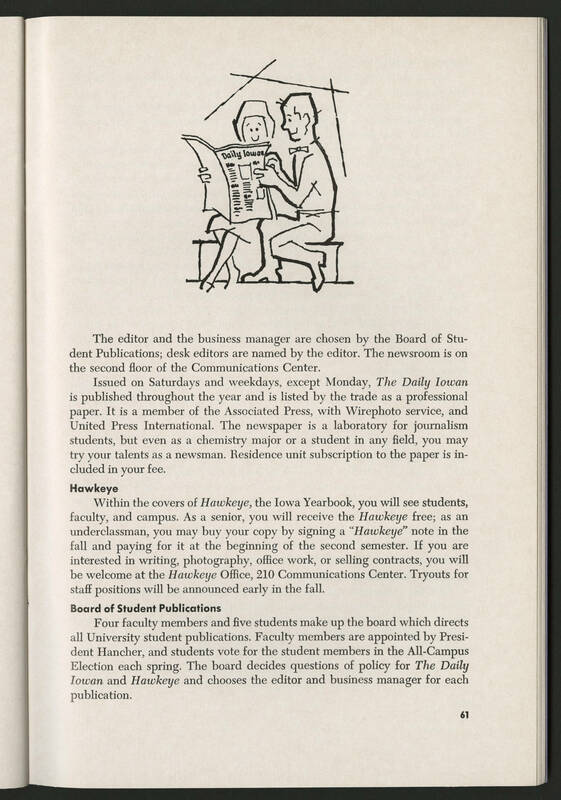 The editor and the business manager are chosen by the Board of Student Publications; desk editors are named by the editor. The newsroom is on the second floor of the Communications Center. Issued on Saturdays and weekdays, except Monday, The Daily Iowan is published throughout the year and is listed by the trade as a professional paper. It is a member of the Associated Press, with Wirephoto service, and United Press International. The newspaper is a laboratory for journalism students, but even as a chemistry major or a student in any field, you may try your talents as a newsman. Residence unit subscription to the paper is included in your fee. Hawkeye Within the covers of Hawkeye, the Iowa Yearbook, you will see students, faculty, and campus. As a senior, you will receive the Hawkeye free; as an underclassman, you may buy your copy by signing a "Hawkeye" note in the fall and paying for it at the beginning of the second semester. If you are interested in writing, photography, office work, or selling contracts, you will be welcome at the Hawkeye Office, 210 Communications Center. Tryouts for staff positions will be announced early in the fall. Board of Student Publications Four faculty members and five students make up the board which directs all University student publications. Faculty members are appointed by President Hancher, and students vote for the student members in the All-Campus Election each spring. The board decides questions of policy for The Daily Iowan and Hawkeye and chooses the editor and business manager for each publication.